How does Metroid producer Yoshio Sakamoto explain his Nintendo DS megahit Tomodachi Collection—still a Japan-only release—to the non-Japanese GDC attendee? 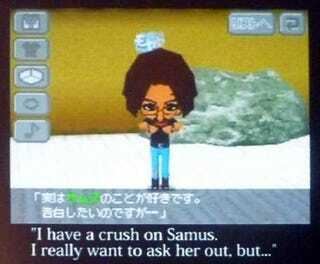 By putting high-level Nintendo execs in weird Tomodachi Collection situations, including Sakamoto's own virtual crush on Samus Aran. Sakamoto showed a quick video during his Game Developers Conference session, which he felt was critical to understanding why nearly 3 million Japanese Nintendo DS owners had purchased the "niche" game. His video showed Mii versions of Nintendo president Satoru Iwata, game designer Shigeru Miyamoto and Nintendo of America president Reggie Fils-Aime from his copy of Tomodachi Collection engaged in some uncharacteristic behavior. Reggie wearing a kimino, for example, and Sakamoto turning into the Godzilla-sized "Saka-mojo," tearig down buildings. But it was Sakamoto's proposal to Metroid heroine Samus Aran that was most enjoyable. The tragic third scene of Sakamoto's proposal to Samus.